The 24-year-old is in pole position to finish the campaign as the country’s top goalscorer having netted 28 times for the Citizens in Ladbrokes League Two and 36 times in all competitions this term. It’s a phenomenal feat for a player who, prior to joining the Capital outfit last summer, had struggled to hit the goal trail on a consistent basis. That said, his previous best stood at 18 when he was with Berwick Rangers a couple of years ago. Henderson had targeted 20 before the campaign got underway but had reached that tally when he scored the opener in a 6-1 Scottish Cup replay defeat to Inverness in early December. His goals have been instrumental in keeping the City promotion push in full flow. 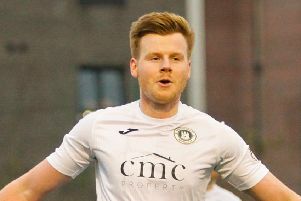 And although James McDonaugh’s men relinquished their position at the top of the table to Peterhead earlier this year – they trail the Balmoor outfit by five points with as many matches remaining – Henderson, who is out of contract at the end of the season, insists he sees his future at Ainslie Park even if they come up short next month. “I really enjoy playing where I am,” Henderson told the Evening News. “I don’t think I’d want to go another part-time team. The club are close to home, training is later in the evenings which is good for getting home after work and getting something to eat so it just fits for me. I think every player would rather be playing in League One than League Two so hopefully I can help the team get promotion. “I don’t know if there will be any interest from other clubs. I don’t really know how the bigger clubs look at the division as a whole. It’s difficult to say. I don’t know if full-time football is something I’d really consider as I’ve got a good job in finance at the moment so it would need to be a really good offer to tempt me away. It’s another must-win for City tomorrow as they cross the Forth to play Cowdenbeath at Central Park. With leaders Peterhead and third-placed Clyde going head to head, Henderson appreciates something has got to give at Broadwood. “We have to win tomorrow as we want to keep pushing Peterhead right until the end. I think we’ve known since we drew 0-0 with them a couple of weeks ago that we’re going to have to win every game to stand a chance,” he said. “With five games to go, I’ve now set myself a target of 40 goals. Even if I didn’t score another goal between now and the end of the season I’d still be delighted. I’ve got to keep pushing myself and if we want to catch Peterhead then I’m going to have to score a few more. “I just hope the chances continue to fall my way. At this moment in time I’m the top goalscorer in the leagues in Scotland.